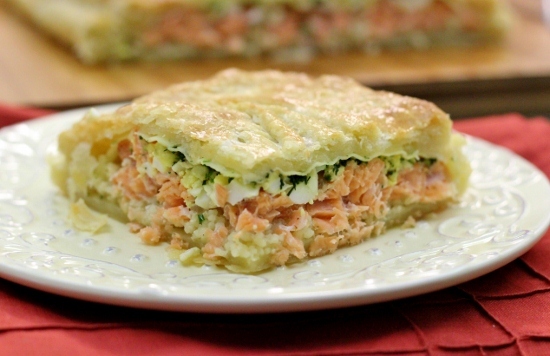 Kulebyaka, the Russian savory pie, goes back in history as one of the traditional dishes of Russian cuisine. 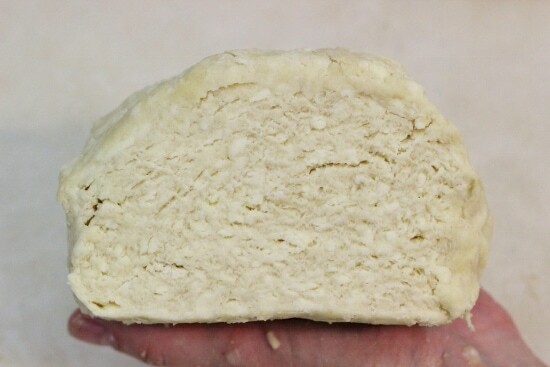 In many versions of the kulebyaka, a yeast dough is used, but the puff pastry is also quite popular. I think this dish is a wonderful example of the resourcefulness of Russian people. With the long, harsh winters and short summers, they had a very limited amount of available ingredients. 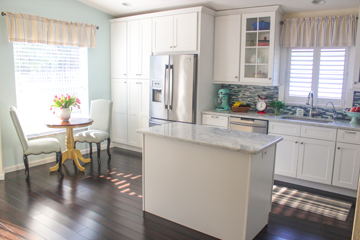 Even with such sparsely furnished pantries, they still managed to create amazing masterpieces. When you take a look at the different filling combinations, it’s interesting to note the pattern of using fundamental supplies that were very common in the Russian kitchen, such as cabbage, buckwheat, mushrooms, fish and meat. Most of the time, kulebyaka is served with soup, and can be served as a main dish or as an appetizer. 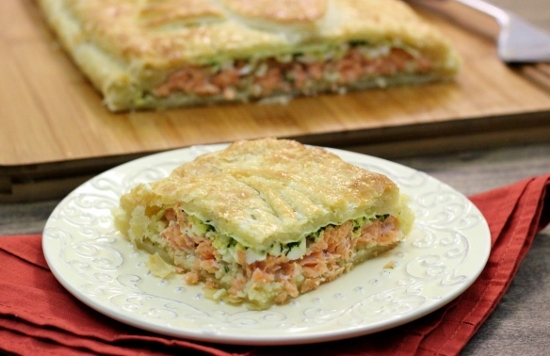 I read many, many recipes for Salmon Kulebyaka and tested several versions in my own kitchen. I combined all my favorite elements to make one awesome, delicious fish pie. 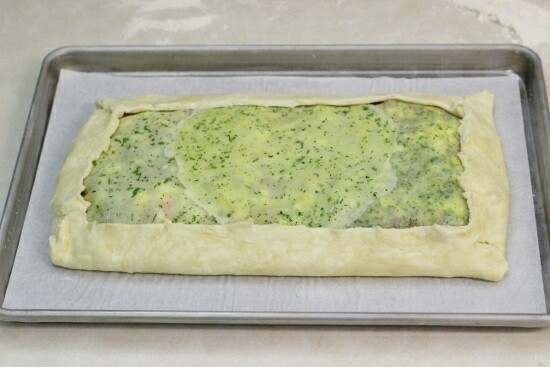 I used a quick puff pastry for the dough and filled it it salmon, hard boiled eggs and caramelized onion. Instead of rice, which is what’s most commonly used, I used couscous. 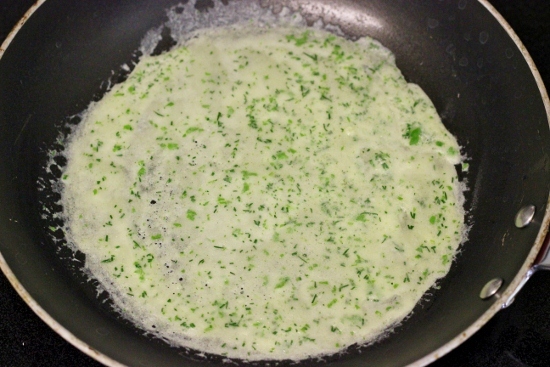 With the addition of dill crepes, the filling turned out light and airy. The recipe for dill crepes I got from The Pie and Pastry Bible and that’s also where I found the idea for using couscous. This dish has many different components and if you do all your prep, assembling it will be very easy. You can even do the majority of the work a day ahead and put it all together in less than 30 minutes. Make the quick puff pastry and hard boil the eggs. Combine all the ingredients for the crepes in a blender and mix. 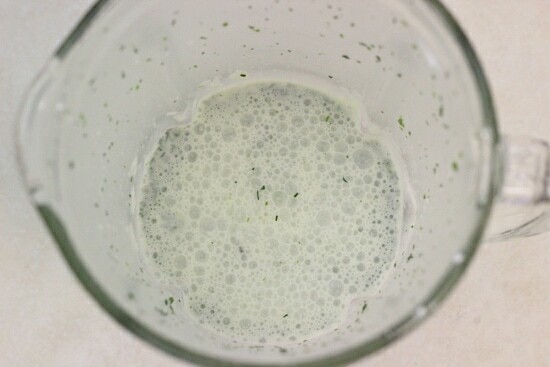 You can also mix all the ingredients together with a whisk. Heat a nonstick skillet over medium high heat. Swirl a tiny dab of butter on the bottom of the pan. Pour about 2 Tablespoons of batter into the hot skillet and tilt the skillet to distribute the batter evenly over the surface of the skillet. Cook for about 30 seconds, flip the crepes over and cook for a few more seconds. Place the crepe on a dinner plate and continue with the rest of the batter. You should have 4-5 crepes. Set aside. 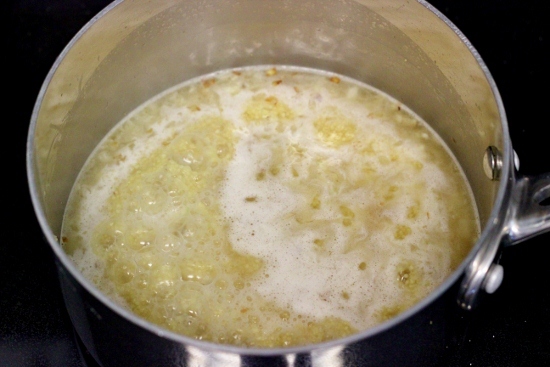 Melt the butter in a small pot. Add the onion, season with salt and cook on medium heat for about 5 minutes, until the onion is soft. Add the minced garlic and cook for another 30 seconds. Add the couscous, and toast for about 2 minutes. Add the warm broth and bring to a boil. 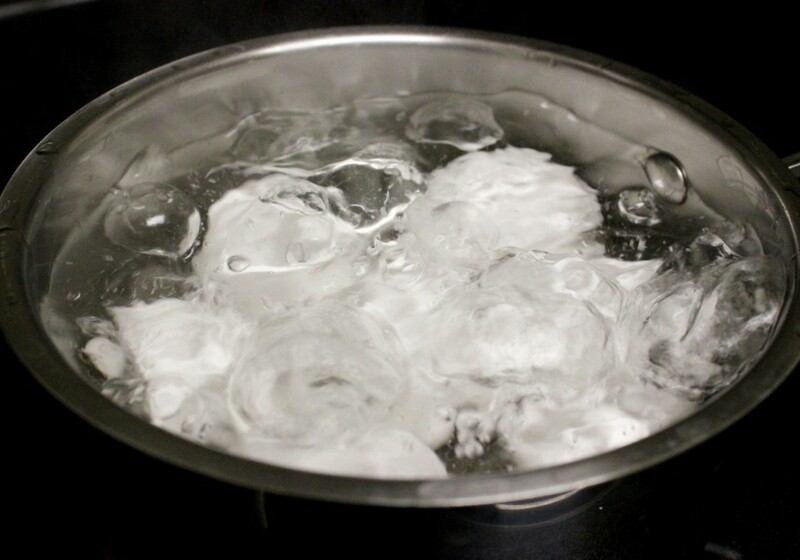 It should boil right away. Take off the heat and let it stand for 15 minutes, covered. Fluff with a fork. Set aside. Melt butter in a skillet. Add the sliced onion, season with salt. 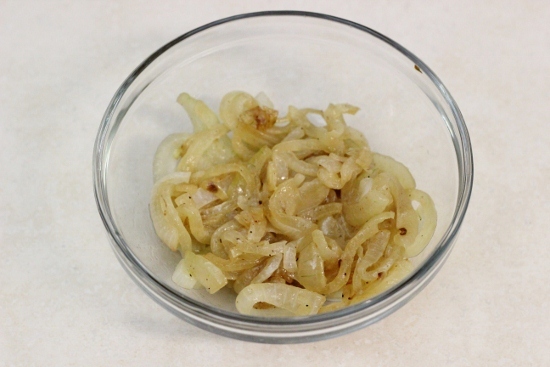 Cook for 8-10 minutes, until the onions have softened and are golden. If the skillet dries and the onions aren’t caramelized yet, add a splash of water or chicken broth. Set aside. You can also add sliced mushrooms to the caramelized onion and cook them down together. Mushrooms taste really great in kulebyaka. The couscous, crepes and caramelized onions need to be completely at room temperature before adding them to the kulebyaka. While I’m waiting for them to cool, I usually chop the salmon, chop the hard-boiled eggs, mince the fresh herbs and prepare the egg wash. 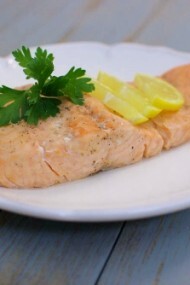 If you’re not sure how to take the skin off the salmon, I have a post all about it. Season the salmon with 3/4 -1 teaspoon salt and 1/2 teaspoon freshly ground black pepper. Preheat the oven to 400 degrees. 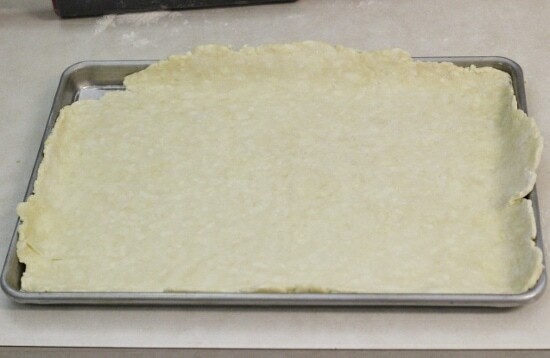 Line a rimmed baking sheet (18×13 inches) with parchment paper. You don’t have to use parchment paper, but it will be a big help to take out the salmon kulebyaka in one piece once it’s baked. 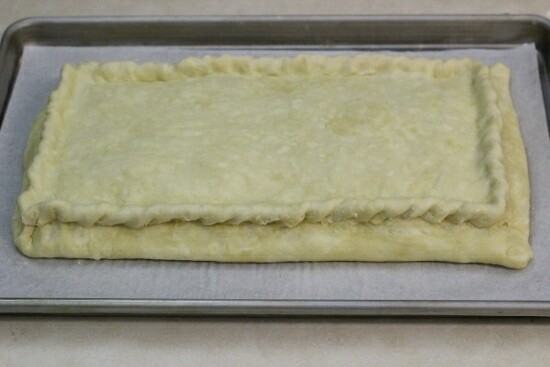 Take out the quick puff pastry. Cut it in 2, with one of the portions being larger than the other. 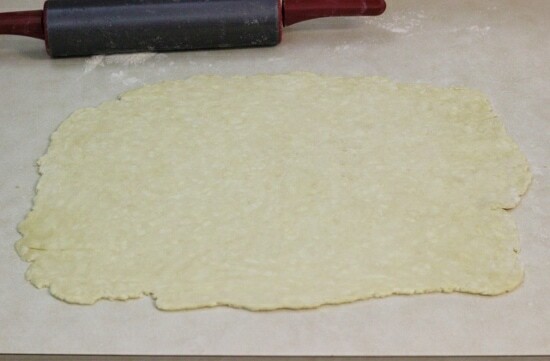 Roll out the bigger portion on a floured surface. It should just about cover the baking sheet. 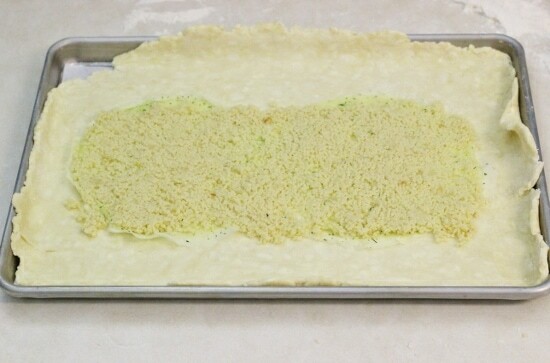 Place the rolled out dough in the prepared baking sheet. Start layering all the ingredients into the kulebyaka. Place 2 crepes in the bottom and center of the pan. Place half of the couscous mixture over the crepes. Layer the salmon over the couscous. Place the caramelized onions on top of the salmon. Sprinkle in the hard boiled eggs, followed by fresh dill and parsley. Spread the other half of the couscous on top of the herbs and cover with two or three more crepes. 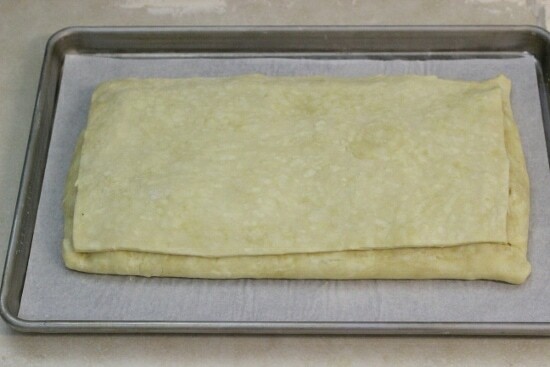 Lift the edges of the dough and fold over the filling by about 2 inches. Cut off the excess. 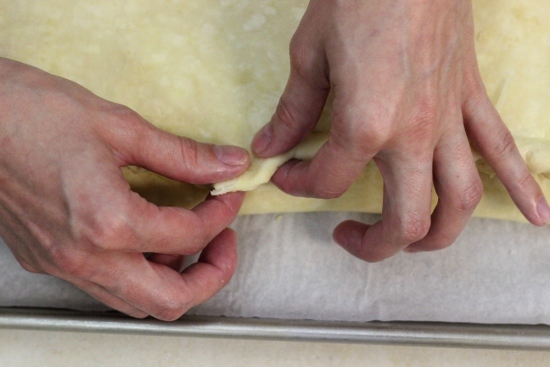 Roll out the other portion of puff pastry and place it on top of the kulebyaka. 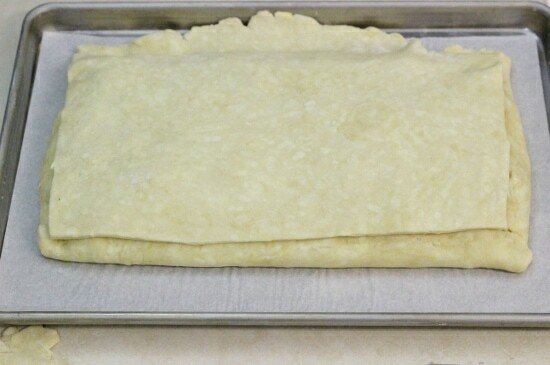 Cut off the excess dough, letting it overlap the bottom layer slightly. 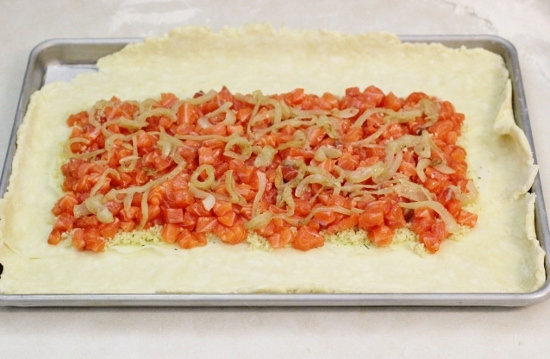 Seal the edges of the top and bottom layers of dough by pinching them together. Crimp the pinched seams. I used a rope crimping. The idea here is to keep the edges from opening while in the oven. Roll out the scraps of dough and cut out designs to place on top of the kulebyaka. I cut out a fish and some seaweed. Russian pies are very well known for having all sorts of designs on top of them. You can make it as fancy as you like. I kept mine really simple. I’ll bet kids would really like this:). Poke several holes on top of the kulebyaka for the steam to escape while baking. Brush it with the egg wash. Bake the kulebyaka in the preheated oven for about 30 minutes, until golden brown. Do you see how gorgeously tender and flaky the dough baked up? 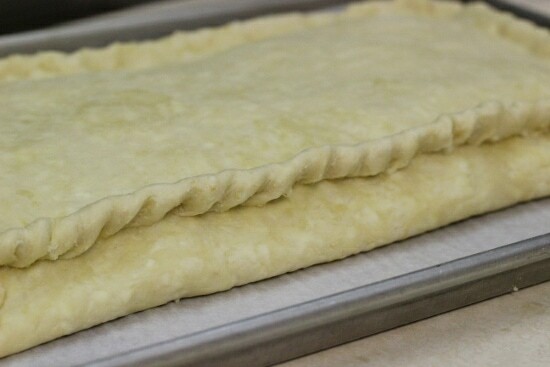 Make the puff pastry and hard boil the eggs. Combine all the ingredients for the crepes in a blender and mix. 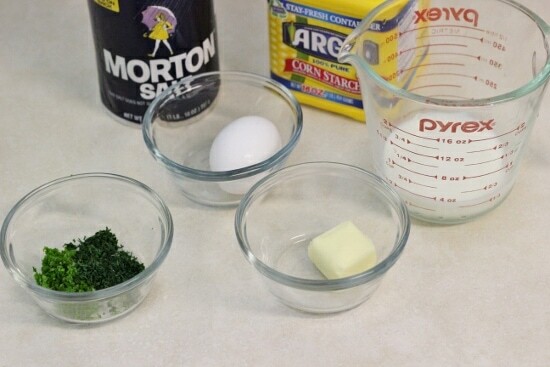 You can also mix all the ingredients together with a whisk. Heat a nonstick skillet over medium high heat. Swirl a tiny dab of butter on the bottom of the pan. Pour about 2 Tablespoons of batter into the hot skillet and tilt the skillet to distribute the batter evenly over the surface of the skillet. 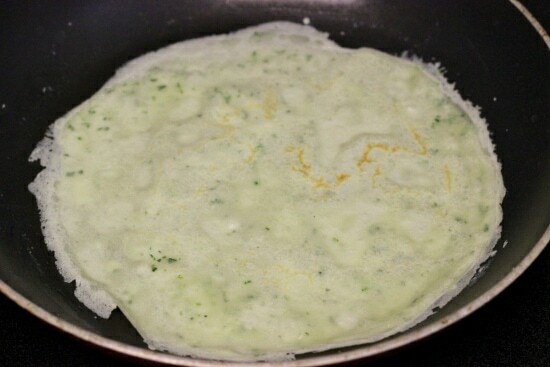 Cook for about 30 seconds, flip the crepes over and cook for a few more seconds. Place the crepe on a dinner plate and continue with the rest of the batter. You should have 4-5 crepes. Set aside. 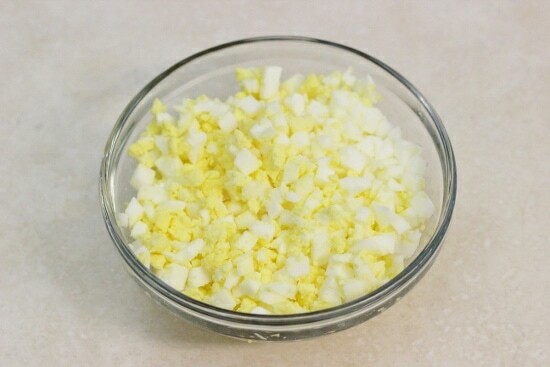 Melt the butter in a small pot. Add the onion, season with salt and cook on medium heat for about 5 minutes, until the onion is soft. Add the minced garlic and cook for another 30 seconds. 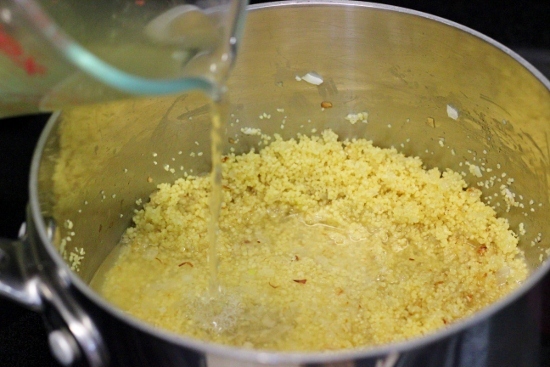 Add the couscous, and toast for about 2 minutes. Add the warm broth and bring to a boil. It should boil right away. Take off the heat and let it stand for 15 minutes, covered. Fluff with a fork. Set aside. Melt butter in a skillet. Add the sliced onion, season with salt. 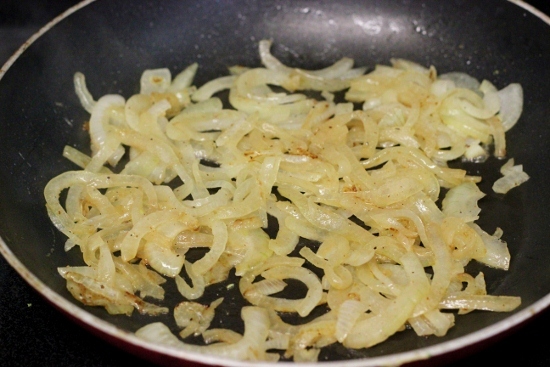 Cook for 8-10 minutes, until the onions have softened and are golden. If the skillet dries and the onions aren't caramelized yet, add a splash of water or chicken broth. Set aside. You can also sliced mushrooms to the caramelized onions and cook them down together. Mushrooms taste really great in kulebyaka. 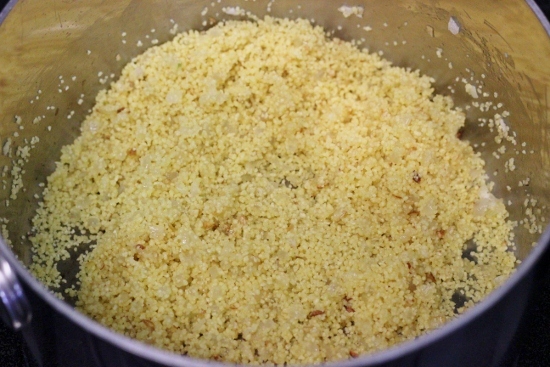 The couscous, crepes and caramelized onions need to be completely at room temperature before adding them to the kulebyaka. While I'm waiting for them to cool, I usually chop the salmon, chop the hard-boiled eggs, mince the fresh herbs and prepare the egg wash. 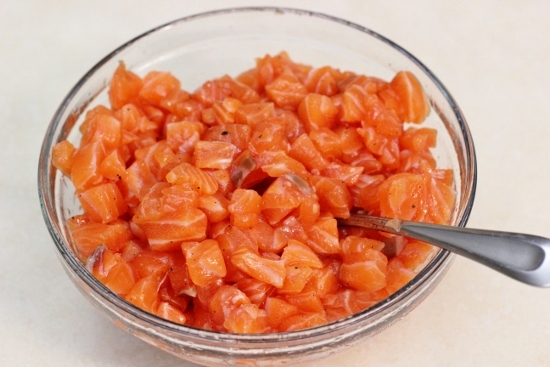 Season the salmon with ¾ -1 teaspoon salt and ½ teaspoon freshly ground black pepper. Preheat the oven to 400 degrees. Line a rimmed baking sheet (18x13 inches) with parchment paper. You don't have to use parchment paper, but it will be a big help to take out the salmon kulebyaka in one piece once it's baked. 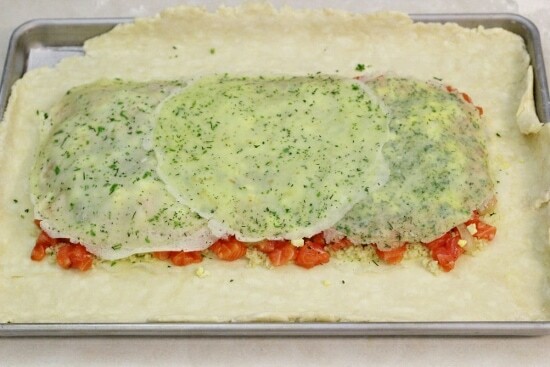 Take out the quick puff pastry. Cut it in 2, with one of the portions being larger than the other. Roll out the bigger portion. It should just about cover the baking sheet. 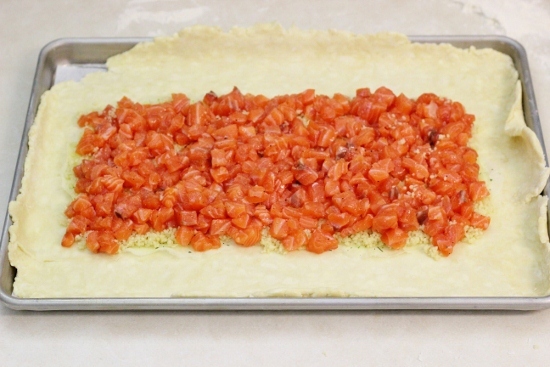 Place the rolled out dough in the prepared baking sheet. Start layering all the ingredients into the kulebyaka. Place 2 crepes in the bottom and center of the pan. 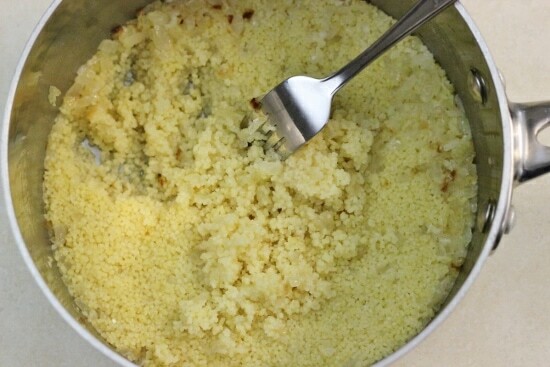 Place half of the couscous mixture over the crepes. Layer the salmon over the couscous. Place the caramelized onions on top of the salmon. Sprinkle in the hard boiled eggs, followed by fresh dill and parsley. Spread the other half of the couscous on top of the herbs and cover with two or three more crepes. 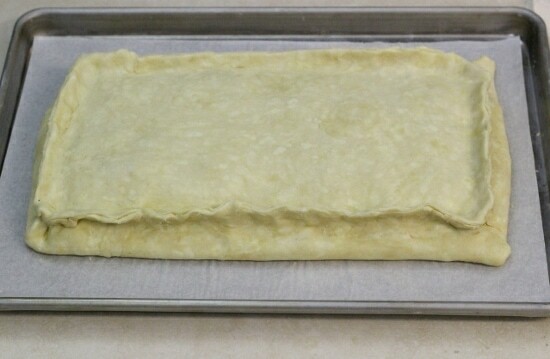 Lift the edges of the dough and fold over the filling by about 2 inches. Cut off the excess. 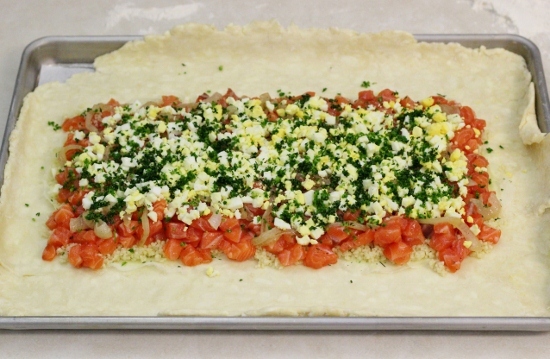 Roll out the other portion of puff pastry and place it on top of the kulebyaka. 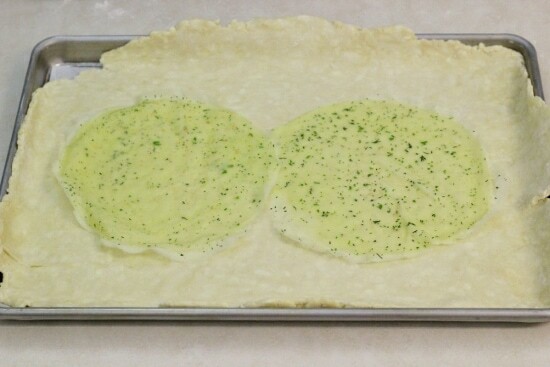 Cut off the excess dough, letting it overlap the bottom layer slightly. 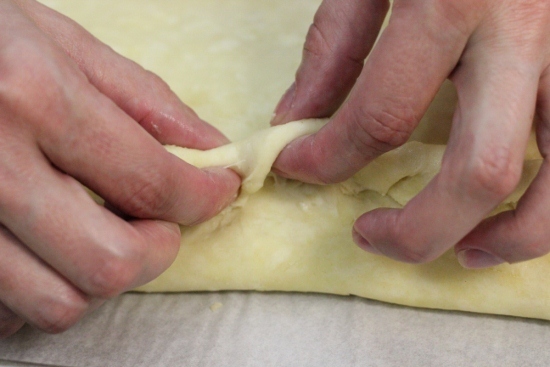 Seal the edges of the top and bottom layers of dough by pinching them together. Crimp the pinched seams. I used a rope crimping. The idea here is to keep the edges from opening while in the oven. Roll out the scraps of dough and cut out designs to place on top of the kulebyaka. I cut out a fish and some seaweed. Poke several holes on top of the kulebyaka for the steam to escape while baking. Brush it with the egg wash and bake in the preheated oven for about 30 minutes, until golden brown. Wow olga. I’ve never heard of this before but it sure looks so tastey. Yum!! Looks delicious! Never seen it before either and it looks time consuming but full of flavor! Lol I’m with second Olga here, never heard of such dish, looks amazing! 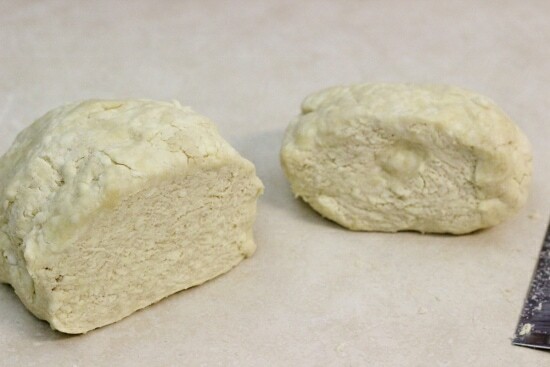 I’ll try making it with yeast dough. Thank you! You are such a master at cooking! I hope one day i’ll be as good as you! Awww…. Thanks, Snezhana! You make me blush. Never heard of this dish before but it’s a beautiful presentation. Looks tasty. Do you think it would work with store bought puff pastry? It will definitely work with store bought puff pastry, Katerina. However, I’m not sure how much of the pastry you need. You’d have to figure that out for yourself. This looks wonderful. 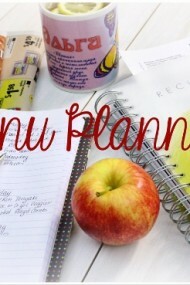 I’ve bookmarked it cause I want to try this for one of our gatherings. This was a AMAZING dinner!! Trying it today! 🙂 Thanks Olga! Amazing recipe and directions, the pics are great except out of order. How are they out of order? This was so tasty! I made It last week and had my parents fighting about the last slice. The puff pastry is what made it so good! Store bought will never compare to your recipe! It’s worth all the extra work! I’m so happy to hear that, Oksana! 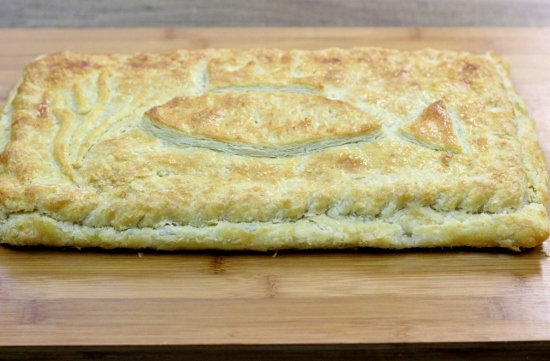 I agree about the puff pastry; it really does make a difference, and it’s very easy to make too:). Thanks for taking the time to let me know. I’m so glad you stopped by, Laura. Welcome! 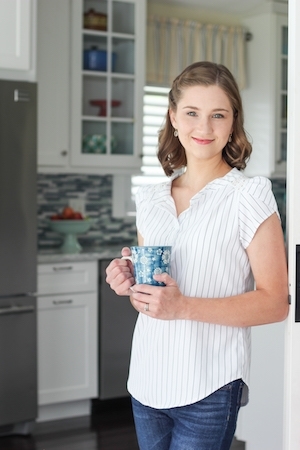 I hope you’ll find many recipes that will become family favorites. Thanks for taking the time to write to me. 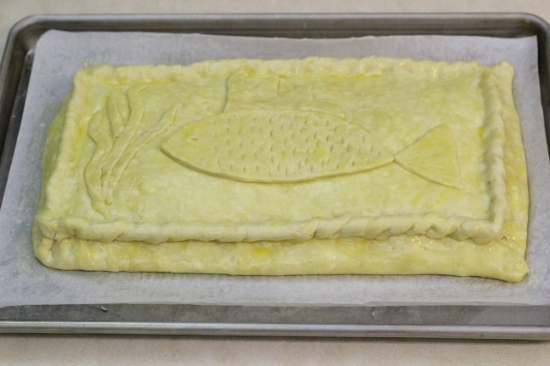 I have made salmon pies before but i have always used the yeast dough, i should try with pastry dough. It looks very good!!!!!!!! 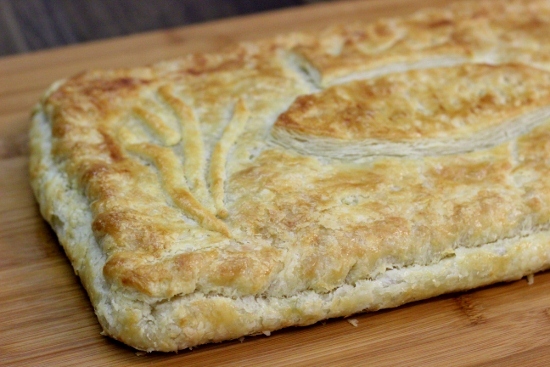 Yep, a puff pastry dough goes really well with this dish. We love it:). This looks breathtakingly yummy!!!! I have never heard of this dish, but I am so excited to try it! 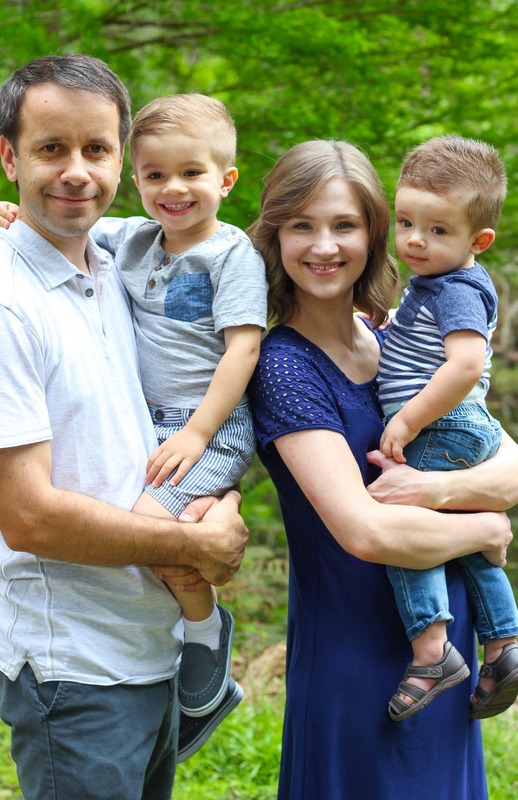 Thank you so much for posting it! Thank you, Inna! I hope you enjoy it. 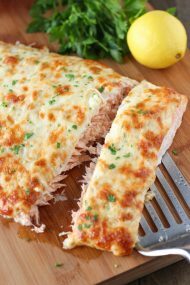 My freezer is full of salmon that my hubby caught, so I appreciate all of your salmon recipes. I have this dish in the oven right now and it looks so good! Thank you! !